Of all the April Fools jokes out there on the interwebs yesterday — well, of the limited number I saw, since I was mostly offline — I think the one by WordPress announcing AutoMatton was my favourite. As WordPress.com becomes easier to use, one piece of unanswered feedback keeps nagging at us: blogging is hard! Not only do you have to think of something worth saying, you have to take valuable time out of your day to write those things down in an appealing, easy-to-read way! Improvements to WordPress.com can speed up things like load times, but we simply couldn’t remove human nature from the equation… until now. AutoMatton uses a simple machine learning algorithm to predict the posts that you will write, taking predictive text and auto-correct to the next level. Yeah, they got me. It took me way too long to realize they were kidding. I tell myself this gullibility was because I was skimming through email not long after waking up and before a significant amount of caffeine had hit my bloodstream and I was still feeling pretty groggy . . . But honestly? I really really wanted to believe this was an actual thing. You see, I’m having a tough time coming up with appropriate blog posts. I’m not sure when, exactly, I started worrying about being all appropriate over here, and maybe I should knock it off, but every time lately I feel a thousand or so words bubbling up in my brain it’s usually about the drama du jour and . . . I just can’t make myself write the post. But then I stop and ask myself: do you really want to be that person? One of the usual suspects who weigh in on everydamnthing, who love the sound of their own voice above all others? One of those who jump in just to see how big a splash they can make? One who, be honest, has nothing new or interesting or enlightening to add other than their own ire or cynicism or questionable wisdom? Do you really want to get sucked into the latest internet quagmire? Oh, look! 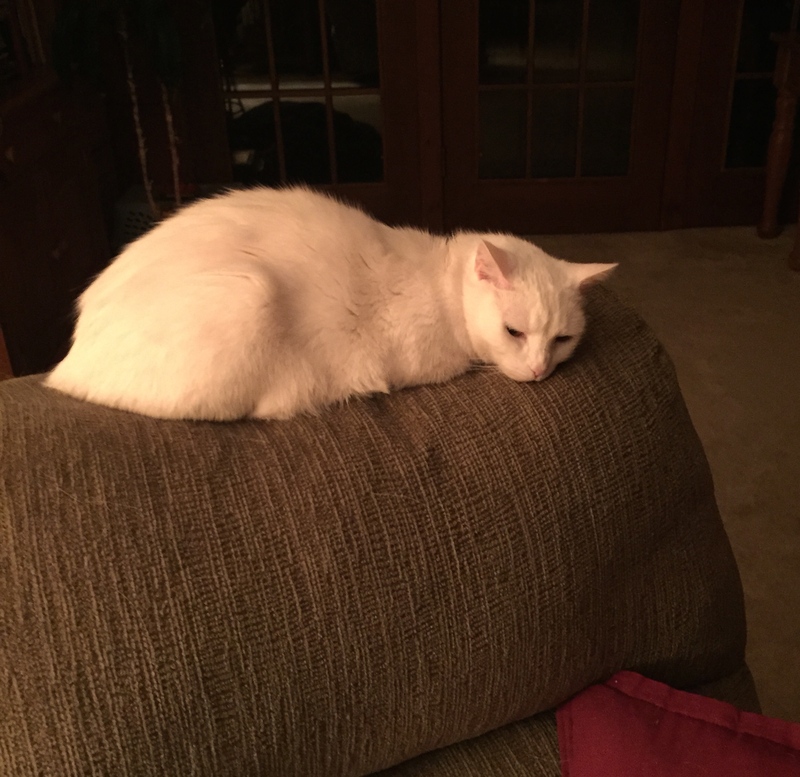 Here’s a diversion picture of The White Ninja, nodding off to sleep on the back of my recliner. But . . . but . . . I should write a new blog post and don’t know what to say! And WordPress’ AutoMatton would have made it all so easy! Just fill in a topic! How is the content created? AutoMatton’s job is to figure out the words that you would use given a specific topic to write about. It scours your existing words, fills in the blanks, and checks its own work. Each post AutoMatton writes is compared to your canon of work, old report card grades, everything written by Kurt Vonnegut, and Terms of Service documents from the top 500 most visited websites. AutoMatton then feeds this information back to itself to improve the accuracy of its predictions. It’s like magic. Actually, the words aren’t the problem. I’m a writer. I can write any number of words, probably too many words, on any given topic, especially the ones listed above. The problem lately has been finding a topic. An appropriate topic. All this self-restraint has been killing me, leaving me without words. You’d think I had killed an albatross. Oooh, and here’s another diversion a sign of Spring! 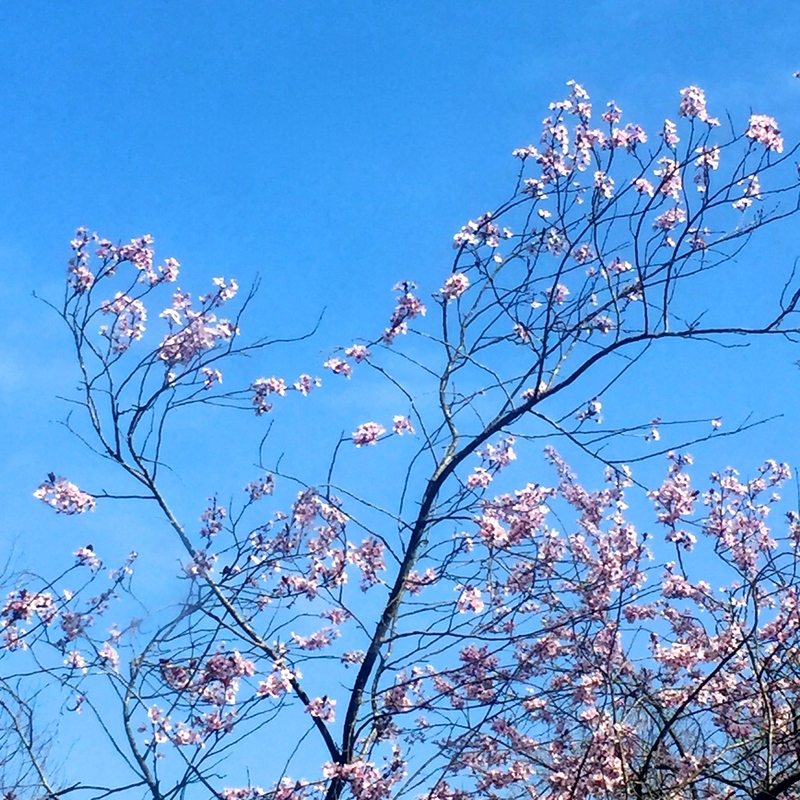 My purple-leaf sand cherry tree blooming against a Carolina blue sky. Whoops. That was from last week and already sadly outdated, not unlike the latest kerfuffle. 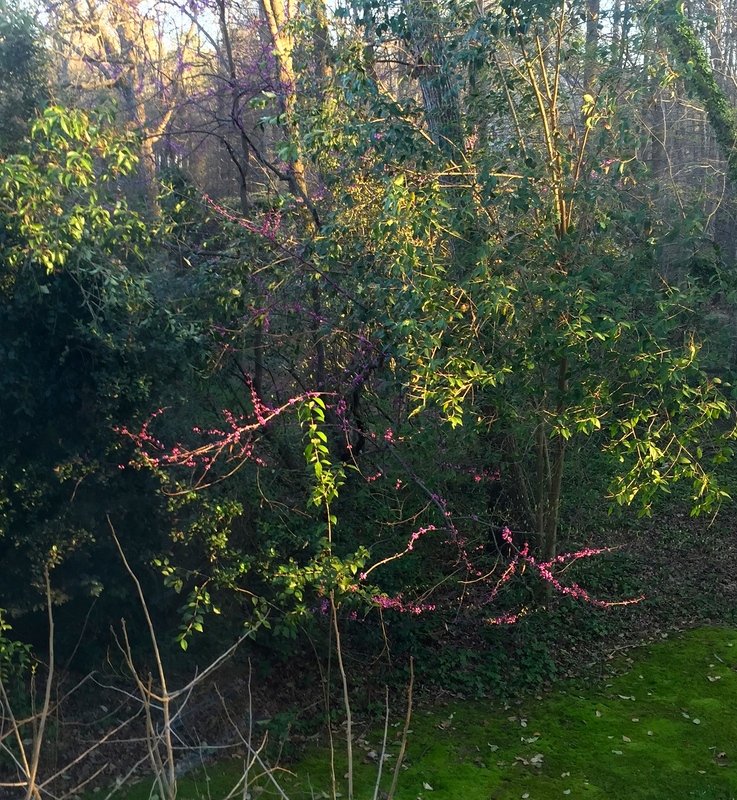 Here’s one from yesterday afternoon: blooming redbud branches poking through the holly bushes and catching the last rays of sunset. It’s so much easier, and far less controversial, to just keep my head down and go back to writing stories. So that’s what I’ve been doing. Giving voice to things both great and small through fiction. Not sure how much longer I can maintain that ruse, but for now that’s my strategy. What have the rest of you all been up to? Anything inappropriate you want to discuss? Anything untoward got you all hot under the collar? Come sit over here by me and spill it. We’ll use our indoor voices.